Twilight’s Taylor Lautner has apparently outgrown vampires and is now interested in comedies. Enter Adam Sandler’s first-ever sequel, Grown Ups 2. Lautner is reportedly in negotiations to star opposite Sandler in a role that would allow him to go “toe-to-toe” with the veteran comedian. Details are in short order at the moment, but reports specify this only as a “fun” role for Lautner, who is looking for another big movie to hang on to. Since The Twilight Saga: Breaking Dawn – Part 2 will be closing out the franchise when it hits theaters November 16th, and even with the lackluster box office response to Lautner’s Abduction, the young star might just strike gold in Grown Ups 2. The original film about a reunion of childhood friends grossed over $160 million domestically. Hit the jump for more on the sequel. 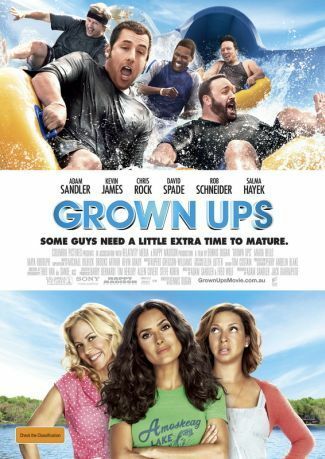 Grown Ups, starring Adam Sandler, Kevin James, Chris Rock, Rob Schneider, and David Spade, is a comedy about five friends and former teammates who reunite years later to honor the passing of their childhood basketball coach. With their wives (Salma Hayek, Maria Bello, Maya Rudolph) and kids in tow, they spend the Fourth of July holiday weekend together at the lake house where they celebrated their championship years earlier. Picking up where they left off, they discover why growing older doesn’t mean growing up.